A couple of days ago I posted the discussion the Filipino organization here in Phitsanulok had with the immigration officers. They said there’s a ministerial order which states that kids below 15 won’t be fined for overstaying. That post received a comment from a “kababayan” that Phuket immigration advised her differently. She was told that if she won’t get a visa for her 9-month old child who is now almost a year overstay, she has to pay 20k overstay fine. I relayed to her what Phitsanulok officer told us, but she insisted that Phuket immigration advised her otherwise. Hmmm. But there’s something right about what she said. Phuket immigration officials are thinking to include kids caught in overstay to be blacklisted or banned on re-entry in the country come 20 March. Yay! The news follows a notice – circulated via a Line group directly linked to Phuket Immigration – plainly stating: “it is not acceptable for children under 14 years old not to have a visa. If your child is under 14 years old and has no visa, you must apply for a visa by 20th Of March 2016. “If they get caught without a visa, they will be banned from Thailand for a minimum of 1 year,” the notice read as reported by The Phuket News. A senior-ranking officer at Phuket Immigration, who specifically asked not to be publicly identified in this report, would not confirm or deny whether the notice was issued by Phuket Immigration staff. 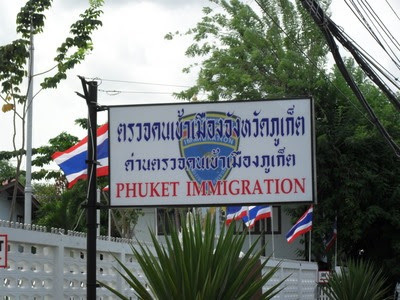 However, the officer did tell The Phuket News today, “The Immigration Bureau wants all foreigners to have the right documents while staying in the country and expects all foreigners and their children to have valid permits-to-stay without any exception – unlike in the past. “The announcement that we will enforce the new overstay rules came three months ago, BUT the issue that is still being discussed is how these rules will apply to children and whether they will need a valid permit-to-stay by March 20 or be blacklisted. “It is a very sensitive issue and covers many criteria. The Immigration Bureau will have a press conference sometime next week to announce more details on this issue,” the officer added. Immigration Bureau chief Nathathorn Prousoontorn on Saturday (Mar 12) repeated his warning to all foreigners illegally staying in the country on “overstay’. Under new Interior Ministry regulations, foreign travellers who overstay more than 90 days will be banned from re-entering the country for one year, he said.